A public fire alarm covered in graffiti on the bike path on Lake Champlain in Burlington, Vermont. Graffiti often interests me. Yes, it can be destructive, ugly, and offensive but it can also suggest ways in which public spaces or privately-owned but publicly-accessible spaces are perceived through the eyes of people--particularly, youth (and in truth here, I'm assuming that the majority of graffiti are people under 25, if I'm wrong in this please let me know). 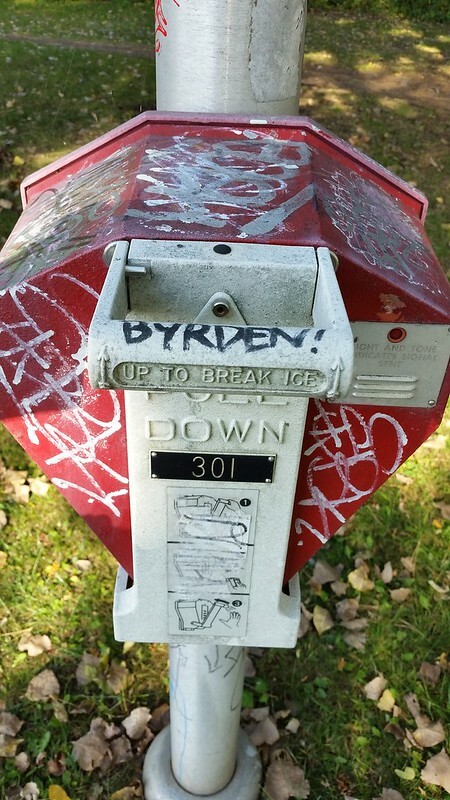 This fire-alarm is on a bike path, a bit removed from roads as it lies on a bike pathm so I found it interesting that while people spent time tagging it with names, they didn't necessarily completely color it over. I'm also impressed that the fire alarm has the instruction to break ice. It makes sense being up in Vermont and on a lake that this would be a useful bit to have on a fire alarm, but I've never seen it on the ones I've encountered.